Roger Chapman's first two solo releases are packaged together here for the first time. The studio album 'Chappo' comes with two previously unreleased bonus tracks. This album was one of Roger's most popular featuring classic tracks such as 'Midnite Child' and 'Moth To A Flame'. 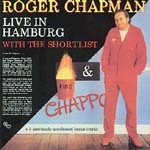 'Live In Hamburg' was recorded on the Shortlist's first German tour and featured here with a bonus track. Detailed sleeve notes and lyrics. More by this artist? Related albums?